Coach Richard Whitelaw’s Community School boys’ varsity soccer team got off to a successful start with three wins. Monday, the Cutthroats debuted their High Desert Soccer Conference season with a 4-0 shutout at Buhl. Last October, the two teams played for the third and final State 3A tourney berth from the High Desert league, with the host Cutthroats (14-6-2) winning 3-2. Jay Fitzgerald (2 goals), Alex Schwartz and Tanner Josey were the Sun Valley goal scorers Monday. Senior keeper Willis Sanchez-duPont posted his second shutout of the young season. “Men of the Match” were Jack Swanson and Keegan Whitelaw. The Cutthroats (3-0, 1-0 league) swept visiting McCall-Donnelly last weekend in Sun Valley by 13-0 and 7-1 scores. Friday’s season debut won by the Cutthroats 13-0 was played in wet and overcast conditions at Browning Field, following a storm that canceled the girls’ varsity game. Fitzgerald (3 goals) and freshman Briggs Whorton (3 goals) scored hat tricks. Other Cutthroat goal scorers were Dehner Figge (2), Charlie Stumph (2), Johnny Blackburn, Josey and Schwartz. Whorton and Stumph, scoring goals in their first varsity starts, were chosen as the “Men of the Match” Friday. On Saturday, junior Schwartz was “Man of the Match” in the 7-1 triumph. Blackburn scored twice along with singles by Fitzgerald, Henry Everitt, James Everitt, Stumph and Gavin Blair. James Everitt and Blair tallied their first varsity goals in their first varsity appearance. The Cutthroat girls and boys host Bliss Tuesday, Sept. 2. Coach Kelly Feldman’s Cutthroat girls (1-1, 1-0 league) recorded their first league and season win Monday 9-2 at Buhl. “Player of the Game” Josie Allison ripped off four goals and Ella Viesturs added two. Singles came from Autumn Fluetsch and Emily Siegel, and there was an own goal. 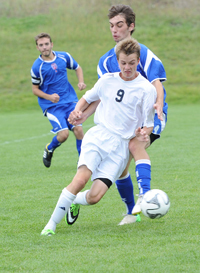 Saturday, Viesturs was the goal scorer in a 3-1 home loss to reigning state champ McCall-Donnelly. “Player of the Game” was Grace Cherp. Coach Doug Stouffer’s Wood River High girls’ varsity dropped a hard-fought 1-0 non-league game Saturday to perennial 5A southeastern Idaho champ Highland at Bannock County Fairgrounds, Pocatello. Jordan Liddil scored the game winner with three minutes left. Twin Falls lost 6-1 and 4-1 to Timberline and Rocky Mountain while Canyon Ridge sustained 10-0 and 3-0 losses to the same teams. Last year’s State 4A runner-up Bishop Kelly fell 4-0 and 4-2 to Boise and Eagle.